The recent Knesset vote to draft yeshivah bachurim pained Jews around the world. A shining light amid the darkness was the bravery shown by one member of Knesset, Yoni Chetboun, who defied his party, Bayit Yehudi, and risked retaliation by casting the single vote against the bill, resulting in a final tally of 67-1. Chetboun was immediately censured by Bayit Yehudi leader Naftali Bennett, who removed him from the prestigious Foreign Affairs Committee and instituted other sanctions against him. 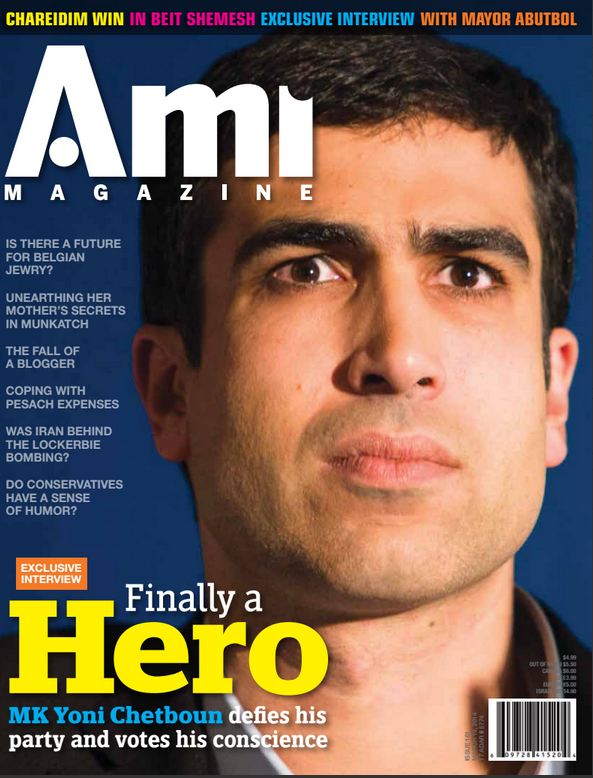 Read the entire interview in this week’s Ami Magazine. Next articleQ&A: Am I Stuck In My Job’s Costly Health Plan? Naftali Bennett has shot himself in the foot. Until two years ago it was a given in Israeli politics that the hareidim would support the “right” if there was any possibility of a right-wing government. Now there is a real danger the hareidim will caucus with the left, and in doing so provide political cover for including non-zionist (largely Arab) parties. After the last election, before Bennett and Lapid formed their alliance, the left had 34 seats, and 11 of those were Arabs who were effectively beyond consideration as allies. Now that the hareidim are again non-zionists, and prepared to deal with anyone to cancel the conscription “decree”, Herzog could muster 52 seats when the opposition met as to boycott the conscription vote. A switch of 10 seats in Israel is not uncommon. It is quite possible that in the foreseeable future, Labor will lead a “left” government that while including non-zionists, will no one from the Dati Leumi camp, the Revisionists/Nationalists, nor any splinters from right-wing parties (such as Lapid or Livni). Chetboun’s position is that of someone kicked off the bus for telling the driver he is lost, and then being the one to watch from the outside when the bus goes over a cliff. The Chofetz Chaim once compared secular zionists (e.g. Lapid) to thieves and religious zionists (e.g. mizrachim like Bennet) to thieves with guns! You tell me who is more of a threat. Thank you for your deeply well reasoned insight. It is so well written and constructively developed. מזל טוב. You got a break from the institution. And yet you still hallucinate and call your self a doctor. BTW, doctors have not used that term for years already. It is amazing how it just took one sentence to give yourself up. Hum, why do you think Ami is retarded? Because they have highlighted the deeds of a courageous individual? I don’t get it. Full disclosure, Ami is my personal favorite. Finally an Orthodox publication with sechel!! If all he has going for him is intelligence, that suggests he sees Bayit Yehudi collapsing due to Bennett’s decision to declare war on hareidim, and is cleverly positioning himself to pick up the pieces. Better to hope he isn’t so calculating and is making a principled decision (the fact that’s he’s Sefardi might suggest he doesn’t share the anti-hareidi attitudes common among secular Ashekenzim). #6… I don’t know if the Chofetz Chaim said what you saisd he said, but for sure he said not to talk Loshan Hara like you.. Yeah, Toras Moshe Emmes..
And Yoni is certainly entitled to his opinion, and 15 minutes of fame.